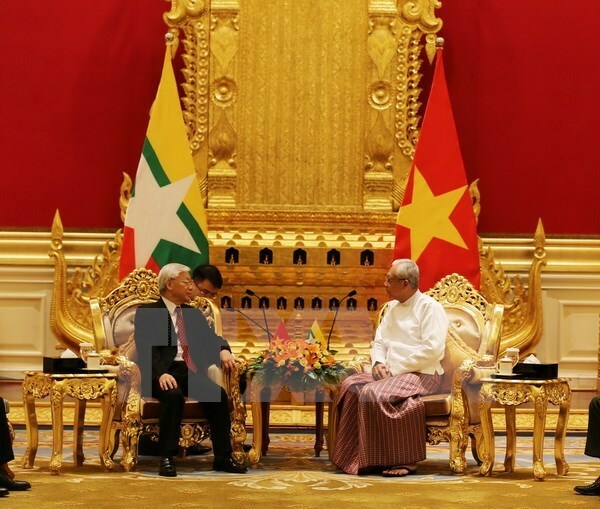 Naypyidaw (VNA) – Vietnam’s Party General Secretary Nguyen Phu Trong and President of Myanmar Htin Kyaw agreed to establish the bilateral comprehensive cooperative partnership during their talks in Naypyidaw, the capital city of Myanmar, on August 24. President Htin Kyaw stressed that Party General Secretary Nguyen Phu Trong’s visit is an important historic milestone and will open up a new chapter in the two countries’ ties. Meanwhile, Party chief Nguyen Phu Trong noted that the visit will offer the two sides to outline strategic orientations to create a new hallmark, a new height and a new impetus for the bilateral ties across sectors. They expressed their delight to see the Vietnam-Myanmar ties growing across diverse areas, especially since former Party General Secretary Do Muoi’s visit in 1997. Two-way trade hit 548.3 million USD, exceeding the set target of 500 million USD. Vietnam has become the ninth largest trade partner and the seventh largest foreign investor of Myanmar. Both sides agreed on major orientations to lifting bilateral ties to a greater height by intensifying political links at all levels, especially at the highest level while continuing to strengthen bilateral relations on the Party, Government, National Assembly, sector and local channels. Further attention will be paid to people-to-people exchange, especially young leaders and people. On national defence-security, they pledged to soon establish the national defence policy dialogue mechanism at the deputy ministerial and vice chief of the general staff levels and the Joint Working Group mechanism at the head of the external relation agency level. The two countries will reinforce joint work in defence industry, army medical training, sharing of information, consultation and mutual support at bilateral forums, especially within the framework of the ASEAN Defence Ministerial Meeting (ADMM) and the ADMM Plus. They vowed to not allow any individuals or organisations to make use of this country’s territory to sabotage the other country. Regarding economic cooperation, the two sides proposed promoting the current development momentum and actively supporting each other to host trade and investment promotion activities to increase trade value. They suggested focusing on cooperation in banking, finance, aviation, telecommunication, and other supplementary fields such as mining, agro-forestry-fisheries, tourism, and consumer products. It is also necessary to increase exchanges and share experience in economic management, reshuffle and institutional reform. Vietnam and Myanmar agreed to enhance air, land and sea route connectivity through stronger cooperation in seaport construction, maritime and aviation transport, and shipbuilding, as well as consider the establishment of an aviation joint venture and the development of roads connecting the two countries and within the cooperation framework of ASEAN, Greater Mekong Subregion (GMS), and Cambodia-Laos-Myanmar-Vietnam (CLMV). The transport of passengers and goods along the bilateral economic corridors will help promote trade, investment and tourism exchanges between Vietnam and Myanmar in particular and in the region as a whole. Party leader Trong took this occasion to thank President Htin Kyaw and the Myanmar Government for creating favourable conditions for the Vietnamese businesses to make investment and hoped the country will provide more support for them to do more for the host country’s development efforts. President Htin Kyaw welcomed Vietnamese firms to step up investment in Myanmar for mutual benefits and highly valued Vietnam’s investment of 500 million USD in tourism. The two leaders also exchanged regional and international issues of mutual concern and affirmed Vietnam and Myanmar have shared a lot of benefits and similar viewpoints on regional and global security matters over the past few years. The two sides have actively coordinated and supported each other at sub-regional, regional and global forums. They agreed to push ahead with information and viewpoint exchanges in such organisations as the GMS, the East-West Economic Corridor (EWEC), and the Ayeyawady-Chao Phraya-Mekong Economic Cooperation Strategy (ACMECS) to intensify cooperation in using effectively and sustainably water resources from the Mekong River for the common development and prosperity of the region and each country. President Htin Kyaw affirmed Myanmar supports Vietnam to run for a non permanent seat at the UN Security Council in the 2020-2021 tenure. As regards the East Sea issue, the two leaders shared the same opinions that any disputes in the East Sea should be settled through peaceful measures and in accordance with international law, including the 1982 United Nations Convention on the Law of the Sea (UNCLOS). They called on the involved parties to implement fully and effectively the Declaration on the Conduct of Parties in the East Sea (DOC) and soon reach a Code of Conduct in the East Sea to maintain regional peace, stability, security and cooperation. Party General Secretary Nguyen Phu Trong and President Htin Kyaw emphasised that Vietnam and Myanmar need to promote role and strengthen coordination with other ASEAN member nations to maintain internal solidarity and unity as well as promote the central role of ASEAN in regional architectures, realise the ASEAN Community’s targets, and contribute to peace and stability in the region.